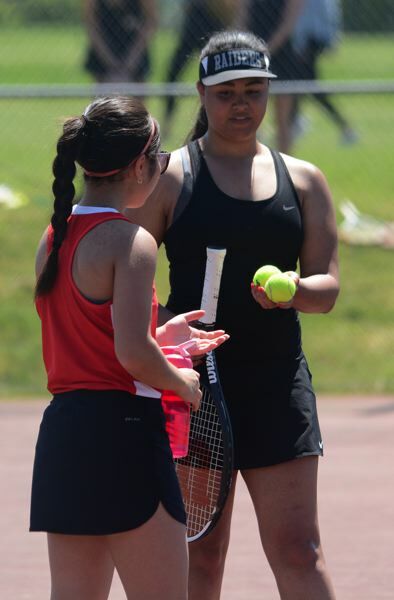 It's been a slow start to the 2019 prep tennis season with frigid weather forcing teams indoors or other times cancelling practice sessions altogether due to snow days or icy after-school conditions. "I haven't seen anything like this — it's been two weeks of freezing temperatures," Barlow boys coach Andrew Pate said. The Bruins have held abbreviated sessions on their outdoor courts where they have space to work on groundstrokes, before moving into the gym for what on some days are simply educational sessions to understand rules and strategy. High school players officiate themselves on match day. League duals are scheduled to begin this week with Central Catholic the reigning regular-season boys champion, while Clackamas appears to be the team to beat on the girls side. The Barlow girls expect to be back in contention for a league title this season after tying for second place last year. The Bruins return reigning district singles champ Grace Maxey, who is back for her senior season. "She has been our anchor for three years now," Barlow coach Eric Strandberg said. "She comes back more relaxed and more confident in her ability to pull herself out of those tough stretches in a match. She has learned to refocus on the positives — on the things she can control." Her biggest challenge comes from Clackamas sophomore Elise Kang, who was the only MHC girl to win a championship-bracket match at state last season. Adding depth to the singles side is sophomore Angelina Utt, who went 10-4 last season, winning all seven of her bouts out of the No. 3 spot before being bumped up to No. 2. The Bruins have a district threat on the doubles courts as well with senior Ainsley Pate back after going 12-2 in No. 1 matches a year ago. Her partner graduated, so this spring she joins forces with sophomore Olivia O'Halloran, who went 10-3 in the middle of the Bruins singles ladder most of last season. "Ainsley had great ground strokes and is strong at the net, while Olivia is a wall who gets her racquet on most shots and is able to put it back over the net," Strandberg said. The Bruins also return the senior duo of Shania Nair and Katelyn Chung, who upset a seeded foe at district last year. "That gave them the confidence that they can do some really good things this year," Strandberg said. The Barlow boys finished third in last year's dual-meet season and saw Christian Maxey claimed the district singles crown. "I don't have to push him to find ways to improve his game — he adds to his skill set on his own. 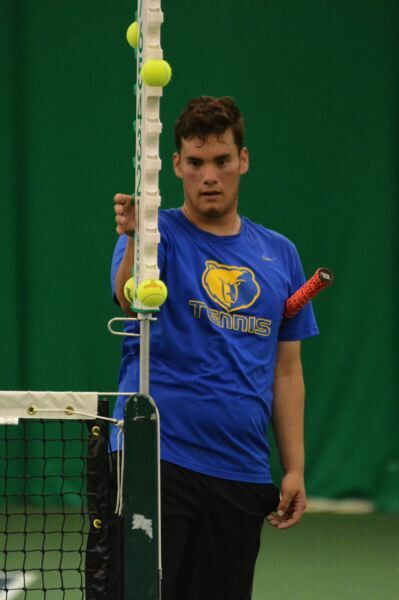 He comes into this season with more serves and more forehands," boys coach Andrew Pate said. "Having a variety of ground strokes allows you to adapt to points and changing circumstances in a match. It's like a golfer having more clubs in his bag." Adding depth is junior Trevor Jones and sophomore Jonathan Cox, who combined to go 19-7 on the singles courts last year. "Both guys faces a variety of styles in singles last year and that experience will be a significant factor for both of them," Pate said. Limited early-season court time has slowed the process of finding the best doubles combinations, although Pate is confident in the large throng of tag-team players he has returning. "We have six guys all of fairly equal talent, who will push each other," Pate said. "I really like our depth and this is a group of guys who every day are working to get better." The Scots tied Barlow for second place in the regular-season standings last year, helped along by a league-best 9-2 record in three-set marathons. The biggest challenge for the Scots will be replacing seven graduated players — four of them state participants. "We have a lot of girls out for the team, and I'm confident that we'll be able to fill in those spots. It's a matter of how consistent we are able to play," David Douglas coach Bret Walker said. He expects most of his teams points to come from the tag-team side, led Pa Xiong and Nicole Lee, who went 11-1 out of the No. 3 spot last year and won several clutch bouts over the course of the regular season. "Out of all the doubles players I've had, they hit the ball the hardest, and they know how to set each other up," Walker said. Also moving up into the top half of the ladder are twin sisters Christina and Christine Le, who went 10-3 in doubles last year, largely while playing with different partners. "I'm hoping we are able to sweep doubles in a lot of duals, we did that a lot last year, and that leaves us to scoop up a win somewhere on the singles side," Walker said. Senior Emily Kostyuk moves up three spots to the top of the singles lineup after posting a solid 8-3 mark in No. 4 matches last year. Sophomore Emily Do is also expected to make in impact on the singles courts. The boys team returns senior Kenton Bui and junior Thien Nguyen, who were paired late in the season and made a run to the district doubles title. While head coach Chad Reeves continues to puzzle over his best dual-meet lineup, he expects both players to see extended time on the singles courts this spring. "They have both played a lot of tennis, and they have really good ground strokes and can cover a lot of court," Reeves said. Senior Jason Bui and junior Randy Cao appear to be the team's best doubles threat. Cao went a combined 9-1 playing out of the No. 2 singles and doubles spots last season, while Jason Bui was unbeaten in three tag-team bouts in the bottom half of the ladder. Senior Abby Hernandez leads the Gresham girls singles lineup after picking up a pair of singles wins last year. "She's a natural lefty, but she can hit her serve with either hand, so she never has to worry about having the sun in her eyes," Gophers' coach Alan Simpson said. "She's the first girl I've ever had on the team who can do that." Also back is senior Julia Moss, who played the bulk of last season in the team's No. 1 doubles spot. 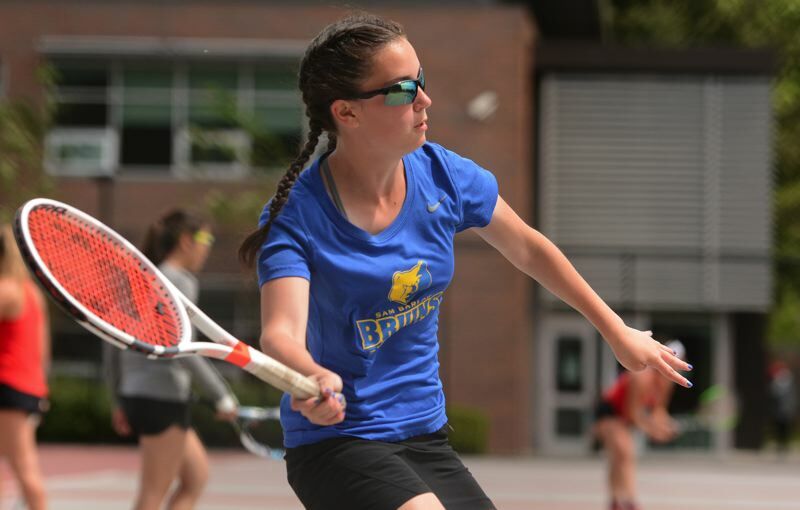 "She has a nice backhand, and she plays a quirky game," Simpson said. "She has a knack for hitting the ball where her opponent doesn't expect." The biggest question for Moss is whether her playing partner Kate Alngog will return to the courts in time for the district tournament. She suffered a knee injury in the final week of the basketball season and her status remains uncertain. "Pretty much everybody in our lineup has varsity match experience," Simpson said. Bart Walker is back on the Gresham courts after 15 years away from coaching, part of that spent watching his daughter's prep career. This year's singles lineup is headlined by senior Hunter Holman and sophomore Rey Hayashi, while senior Jared Davis is expected to be paired with sophomore Elijah Gomez at the top of the doubles ladder. Davis picked up a pair of wins out of the No. 1 tag-team slot last season. "Our team goal is to win that first match and go from there," Walker said. The Gophers were winless in league duals last year, coming closest in a sets tiebreaker versus Reynolds. The Reynolds girls return veteran players at the top of their lineup with senior Sabrina Dyton leading the singles crew after posting a 6-4 record out of the team's No. 2 spot last year and picking up a first-round win at district. The singles ladder also gets a boost from Anna Mer Ballesteros, an exchange student from Spain. Seniors Talina Nelson and Rowan Radke return to the top of the doubles ladder where they won more games (94) last season than any other Raiders' tandem. "They are a fun, hard-working group of kids," Reynolds girls coach Stephanie Shellum said. Based on last year's roster, the Reynolds boys return Ben Nguyen in singles play, while Keanu Freitas and Michael Chao are back in doubles. Those are the only returning players to post multiple wins in league last year. Both Centennial programs finished in the middle of the MHC pack last season. Based on last year's roster, Diane Nguyen is back for her senior year after posting a winning mark in the bottom half of the singles ladder last season. Also back is the senior doubles duo of Sarah Lee and Olivia Harms, who are expected to move to the top of the lineup after posting a 10-4 league record out of the No. 2 spot last year. The Centennial boys return Kenny Chu and Ryan Butler at the top of the singles lineup, while the junior duo of Austin Peng and Triet Ho returns in No. 1 doubles. Winning percentage for Barlow girls in No. 1 matches last season where the Bruins went 25-3. Shutout league wins for the Central Catholic boys on their way to the regular-season title. The Rams also led the league with a .838 win percentage in individual matches. Winning percentage for Mount Hood players, who went 2-16 in championship-bracket play at last year's state tournament. 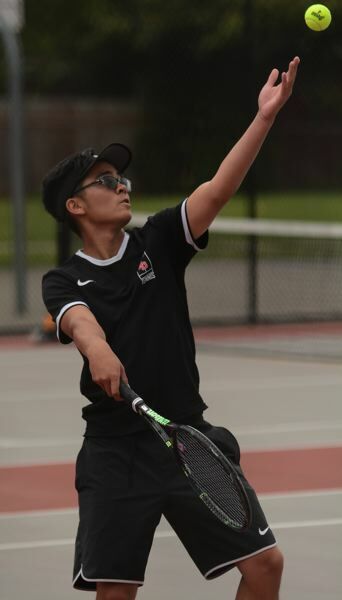 Barlow's Christian Maxey (boys singles) and Clackamas' Elise Kang (girls singles) provided the only wins.